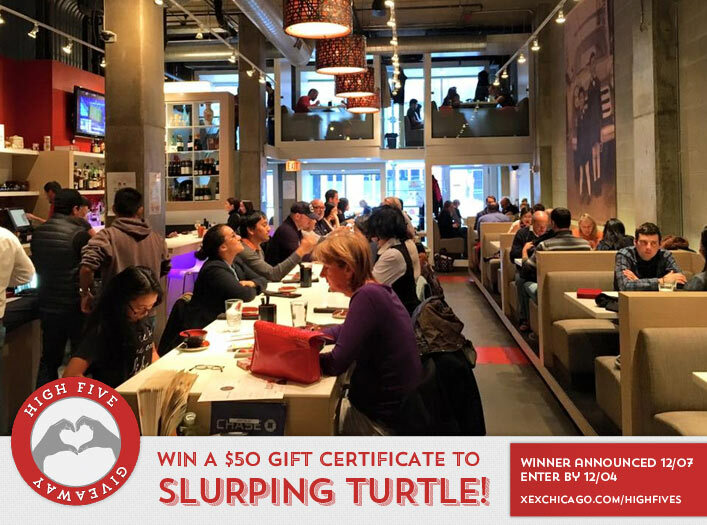 Win a $50 Gift Certificate to Slurping Turtle! Congratulations to Cristina Grieco on winning our 142nd High Five Giveaway and thank you to all who entered! Our next High Five Giveaway is for a $50 gift certificate to Slurping Turtle. Slurping Turtle is located at 116 W Hubbard St., Chicago. Visit their web site at slurpingturtle.com/chicago/ or give them a call at 312-464-0466. What date is XEX’s 11th Annual Holiday Benefit? Now, just add a comment to this post with the right answer to be eligible to win! The winner will be announced on Monday, December 7. Entries must be received by midnight on Friday, December 4. 12-11-15 and I’m not too busy to come. Friday, December 11 from 10-7!